The following books are available from the Estero Historical Society during our Cottage and Schoolhouse hour. All proceeds go to the society for future projects and events that are continually being reviewed. The work of narrative journalism tells the story of Cyrus Teed and his followers who, in 1894, moved from Chicago to a mosquito-infested jungle in Florida to build the city of their dreams, where they believed they would live forever. “Brilliantly written and strangely moving,” wrote Steve Almond, author of God Bless America: Stories. “Millner resurrected the lost history of a cult devoted to a Utopian vision as pure as it was outlandish.” Autographed by the Author. The story of Antonio and Mary Fernandez is fascinating, and it has been the longtime wish of their descendants to tell their story to future generations. The focus of this book is on the couple who brought the Fernandez family to America from Portugal, and the first generation of children they raised here. Learn what it was like to live on Mound Key and in the village of Estero so long ago. Autographed by the author. Darlene truly celebrates her Mother’s life and work as one of Estero’s most loved and memorable pioneers. This collection of images, recipes, and memoirs is intended to capture a few fleeting glimpses of that remarkable life led in a remarkable town. Some recipes are written in Evelyn’s own hand or by a family member or friend. The artwork throughout the cookbook was also done by Evelyn. You will truly appreciate this very unique cookbook. In this book, the author takes a look at what Estero was like before 1882 and after 1899. Such as what kind of town it was, what families were here, how did they survive During the period of 1882-1899 the first homesteader, Gustave Damkoehler kept journals in which his son, Captain E.E. Damkohler shares with us in another book called “The First Settler”. Along with the notes of Mr. Damkoehler and years of research, Mr. Quesnell has done a superb job at giving us a look at this little town we call Estero. 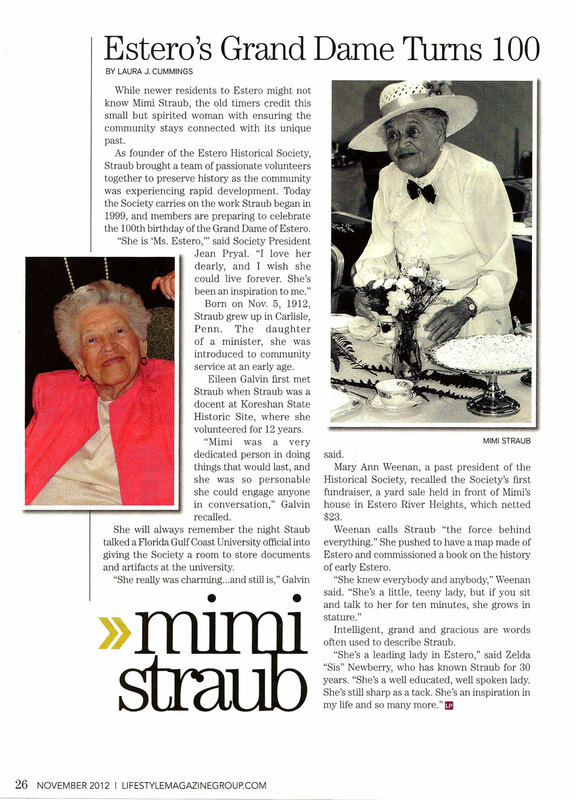 This book is dedicated to Mimi Straub, Dreamer and Builder, Founder and The First President of The Estero Historical Society. The first thing Patricia does is give you Riddles and Rhymes in Part One to see if you can guess the name of the town being described. In Part Two, a story is told for 56 Florida towns with detailed descriptions on how the town once looked, what was it known for, who lived there. Part three concludes the book with “Bits & Pieces”. This section offers interesting tidbits on famous people such as Christopher Columbus, Henry Ford, Juan Ponce de Leon just to name a few. It is an excellent book to use for reference material because of all the research Patricia has done.